The financial crisis had millions of victims but, unlike previous ones, no apparent perpetrators. Jesse Eisinger’s “The Chickenshit Club” blames political timidity, lobbying and D.C.’s revolving door for the failure to prosecute top dogs. Investors may yet regret the change. 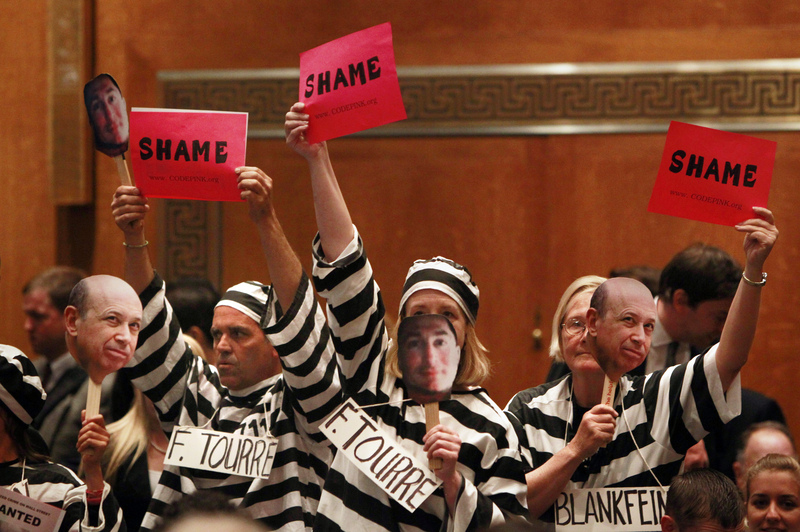 Protesters stand up in the hearing room wearing prison garb and carrying masks of Goldman Sachs Chairman and CEO Lloyd Blankfein and Goldman Sachs executive director Fabrice Tourre during the Senate Homeland Security and Governmental Affairs Investigations Subcommittee hearing on "Wall Street and the Financial Crisis: The Role of Investment Banks" on Capitol Hill in Washington April 27, 2010. “The Chickenshit Club: The Justice Department and Its Failure to Prosecute White Collar Criminals,” by Jesse Eisinger, was published by Simon & Schuster on July 11.